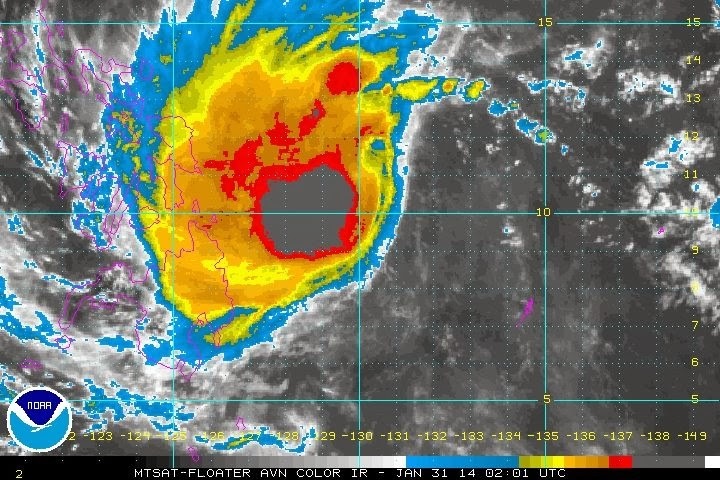 Breaking News: Typhoon Basyang to hit Cebu, Philippines Jan 31, 2014. Basyang gets stronger and its strength becomes 85kph. Signal no.2 raised in many parts of Visayas and Mindanao. Cebu, Bohol, Southern Leyte amd others are now in Signal no 2. It will continue to move in Visayas until February 1, 2014 and will reach Palawan on Feb 3. No rest for the weary! Tropical Storm KAJIKI (BASYANG) is in the Pacific Ocean and heading west, toward the Philippines. Forecasts from all agencies bring it across the southern Visayas and northern Mindanao islands Friday night. Unfortunately, it may affect areas hard-hit by Super Typhoon YOLANDA. The rains may cause flash floods and landslides-- so we urge our Filipino members to take all precautions.